Cymbal makers continuing to expand the choice of effects cymbals can only be a reﬂection of drummers' appetites for new sounds. What once were considered add-ons are now an essential ingredient of many set-ups. These cymbals provide more options for the drummer keen to expand their tonal and textural palette. The ZXT Trashformers sport affordable price tags as well as quirky looks, but deliver a suitably high-end performance. Pricewise, the Oriental China Trashes are perhaps a more considered investment. This quartet of effects cymbals was launched at the beginning of 2010. Two new versions of Trashformer join the budget ZXT Series, while the suitably-named FX Series now contains two additional Oriental China Trashes. The new Trashformers come in 8" and 10" diameters. Resembling raw-looking splashes that have been sat on, Trashformers were created with the assistance of Mike Mangini. The Trashformers are made from cut sheets of B8 bronze. Deliberate misshaping occurs during their manufacture, giving a wavy outer edge. The 10'' dips up and down to a greater degree, presumably on account of its larger diameter. The vivid bands of discolouration are introduced during one of the annealing steps. As this colouring process varies from cymbal to cymbal, Trashformers have something of a handmade appearance, which the wonky edges reinforce further. Located in the FX Series, Oriental China Trashes are designed to be authentically Chinese. 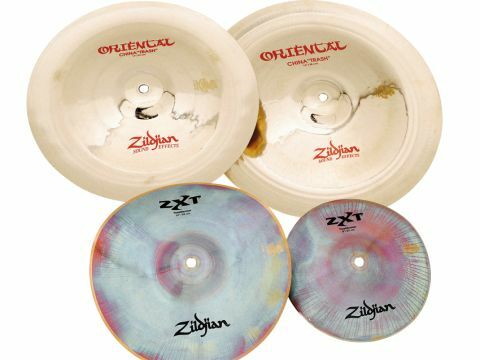 Individually cast from Zildjian's proprietary alloy, the two new chinas are offered in diameters of 13'' and 15''. The 8" Trashformer is fairly close to a regular splash. It's quick and cutting with a trashy edge to its bright note. The 10" shares much of the smaller version's sharp, ﬂeeting response, but the trashiness is far more pronounced. Discordant overtones mingle with the silvery note in a complementary rather than confrontational manner.